First off, I want everyone to know that I LOVE Chick-fil-a and will be frequenting here frequently. 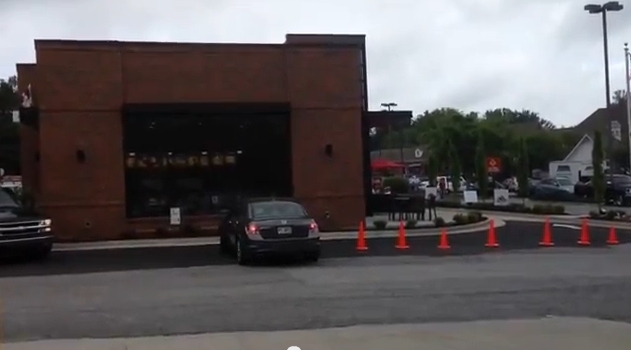 Now please take a look at the short video below I took this afternoon of the Grand Opening of the new Chick-fil-a on Jett Ferry in Dunwoody. It clearly demonstrates to you the problems that are faced by small independently-owned slivers of land within the interior of existing shopping areas without coordinating with the adjacent land owners. You’ll see how there’s issues with the circulation of cars coming in from the interior of the rest of the Williamsburg shopping center property, which is owned by others. Did you know that the little self-standing ATM drive-thru adjacent to this is independently owned? Also the piece of land when Nell's Produce is, is ALSO yet ANOTHER property owner??? Crazy, eh??? Couldn’t we have asked Chick-fil-a to coordinate with the adjacent property owners and develop a holistic plan to accommodate traffic from the interior? Imagine the problems at the "to-be-redeveloped" Sterling Pointe on Ashford-Dunwoody after they subdivide & split all of the separately-owned retail parcels, as well. There’s also no safe pedestrian access off of Jett Ferry, even though their parcel goes right up to the road. And no rack to secure and lock a bicycle. (Also been waiting on Marlows to install theirs since they opened – per the Village Overlay District Ordinance, and I’ve asked at Farm Burger, Workout Anytime, etc…). And, to add insult to injury, they don't have my beloved Coleslaw on the menu! !